When I first started The Great Smith & Deli Sandwich Project, I ate the sandwiches roughly in the order I thought I would like them best…which put The Wiggum a bit of a way down the list. It wasn’t calling to me in the way that some of the earlier ones were. But I was so wrong. It deserves a place much further up my rankings than I thought. The filling is BBQ grilled tofu, maple BBQ sauce, slaw, pickles, chipotle aioli. This sandwich is the perfect combination of soft, crisp, sweet, sour, hot, smoky and it is delicious. I love that this looks really tasty and substantial without mock meat – was wondering if you have been going in on weekends – are the queues getting more manageable or are they still out the door? Hi Johanna, I’ve been in on both weekdays and Saturdays and the Saturdays are a bit busier, but it isn’t crazy like it was. Still a wait, but more like 10 mins rather than 30. Worth it though. 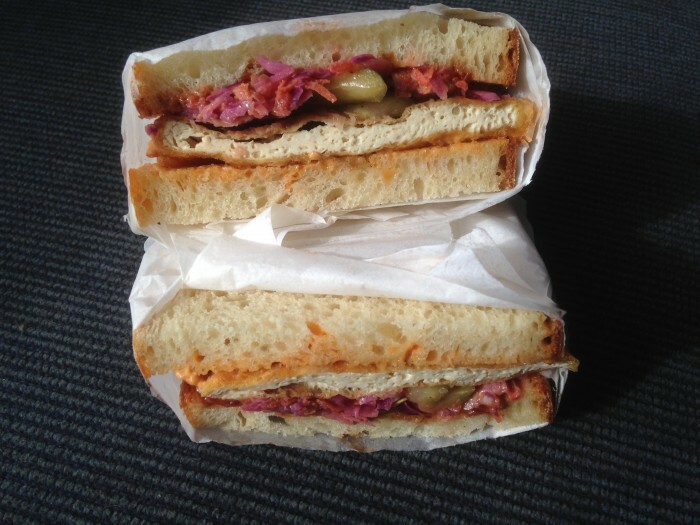 And yes I did love this sandwich and it was nice to have a non mock meat one for a change. Yeah, I’m far more crazy about tofu and tempeh than I am about mock meats. This one looks really good!